Former NFL quarterback Corbin is forceful, charming, and accustomed to getting what he wants ... except where Willow Bradford is concerned. Unable to forget her, he's never stopped regretting what happened between them. When their paths unexpectedly cross again, he's determined to make her give him a second chance. About "Falling For You (#02 in Bradford Sisters Romance Series)"
Customer Reviews For "Falling For You (#02 in Bradford Sisters Romance Series)"
This God of his was a God who was determined to set broken things right. In Book 1 we met Nora and John. 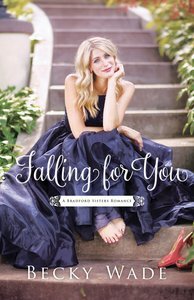 In Falling for you we get to hear the story of Willow, Nora's older sister and Corbin Stewart. Their journey is a road of learning about and how to forgive. Of looking back and finding God has been with them through so many things, both separate and together. Willow and Corbin are thrown together by Corbin's young relative, Charlotte, to search for a missing Great Aunt, Josephine. They need to find a way to work together to help Charlotte but can Corbin get Willow to talk through their past? With Forgiveness, Love and a mystery to be solved this book has been a great enjoyment to read. This is the second book in the Bradford Sisters series and is primarily about Willow, the eldest sister. Yes it is a romance between Willow and Corban but it is so much more. I love the layers of this book and the sensitive and realistic way Becky Wade has handled issues like dealing with mental illness, illegitimacy, identity, guilt and grief. This makes it sound like it is a heavy sad book but it isn't. You will both laugh and cry, feel their pain and their joy, be blessed and maybe challenged. I found it very hard to put down. Falling for You intersperses the present-day story with letters, emails, and text messages from the past and present. It's a novel (!) way to tell a story, and it works as we see the past and present stories of Willow, Corbin, and others. And it's a strong story. It's the romance of two people who messed up years ago, and have to work out if there's a way through that mess to find happiness. Part of that mess was because while Willow is and always has been a strong Christian, Corbin called himself a Christian but didn't live the life (football star, remember?). He's now become a Christian, but finding life hard. Willow has her own problems with faith, and they are so deep-seated it actually takes her a while to realise they even exist. This, to me, was the depth in the book-Willow coming to terms with her past choices, and what that means for her faith. And there was a fascinating suspense plot around Charlotte's secret. Falling for You is a touching tale of love lost and love found again, underpinned by an intriguing mystery, and the power of God to forgive.